Winter break from school has been almost more exhausting than school itself! From dances, to Broadway shows, to late night visits with friends, I barely stopped running from the moment I drove off campus to the end of the year! In a spur of the moment decision (at least, that's how if felt to me!) 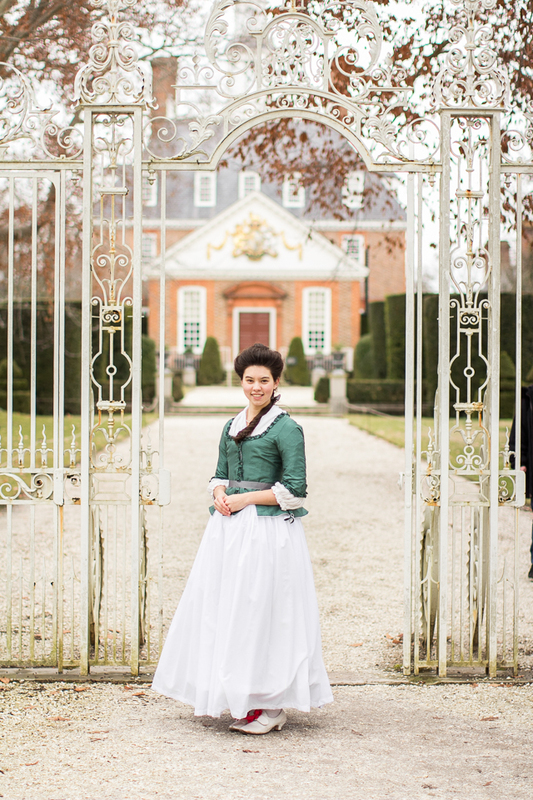 our family went to Williamsburg to ring in the new year. So I decided in my "free time" (free time? what's that?) to whip up a new outfit for Willimsburg. 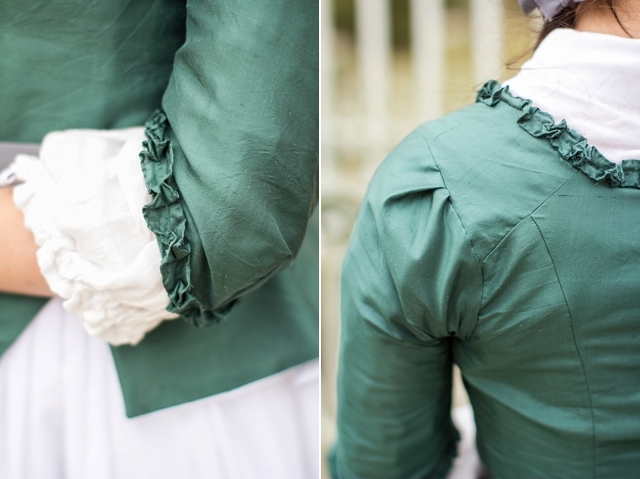 I happened to have left over green silk from my regency dress, and thought that would make a perfect new winter jacket! I just used the same pattern as my other jackets, and added 1" box pleated trim. It was a super simple outfit, and very easy to whip up in a day. Plus it provided a lot of hand-sewing to do on the drive there! 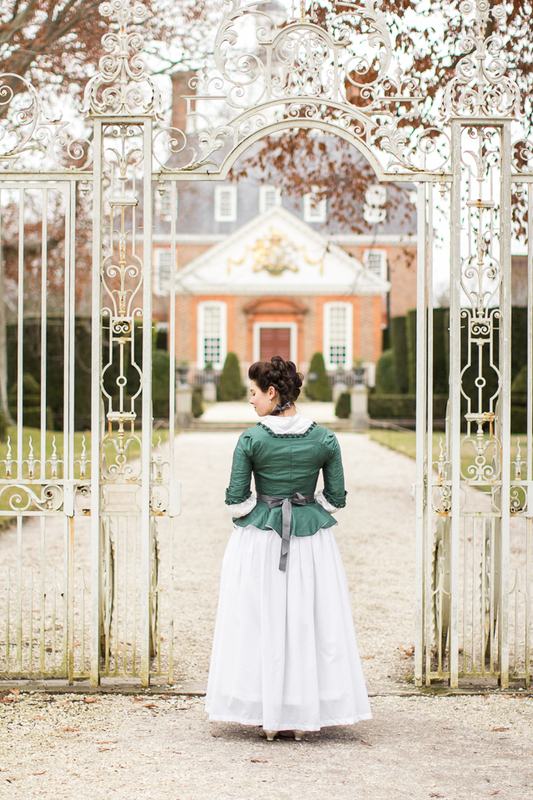 We took the photos outside the garden of the Governor's Palace... it took a while to wait for the perfect moment when there was no one in the garden, but I think it was worth the wait! This was just a goofing off shot, while hoping the people in the garden would leave. As always, thanks to Kathryn Grace Photography for the photos! Sooo worth the wait. I love how these pictures came out!! Thank YOU for taking them!! Oh Tara! You look Lovely! Your outfit is very, very pretty. I wish I had know that you were in Williamsburg because I would have loved to meet you and your family. Someday I hope to be as good at sewing as you are. And your hair is gorgeous! That would have been fun, Emily! We were only there for a few short days, but it would have been great to meet you! Thanks! I love the dress!! Your hair is gorgeous!! I love the background where you took the photos!! Beautiful! 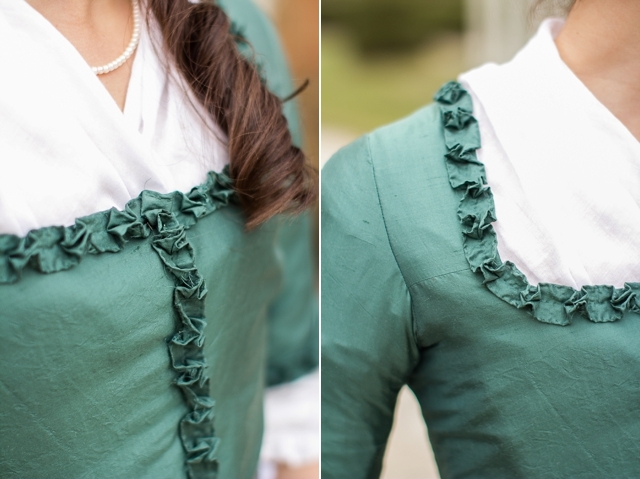 Love the color of the silk jacket and especially paired with the white petticoat. It reminds me of that stunning jacket in the Kyoto Costume Institute. Oh so beautiful! What a lovely way to ring in the New Year. It was a wonderful way to celebrate the new year! :) Thanks, Brigid! Aw, thanks!! That's quite a compliment! Hello, Tara! I just discovered your blog. What a lovely site! Your love of sewing and the photos of your latest projects has inspired me to spread my wings in sewing. I have done a little, but hope to do much more. 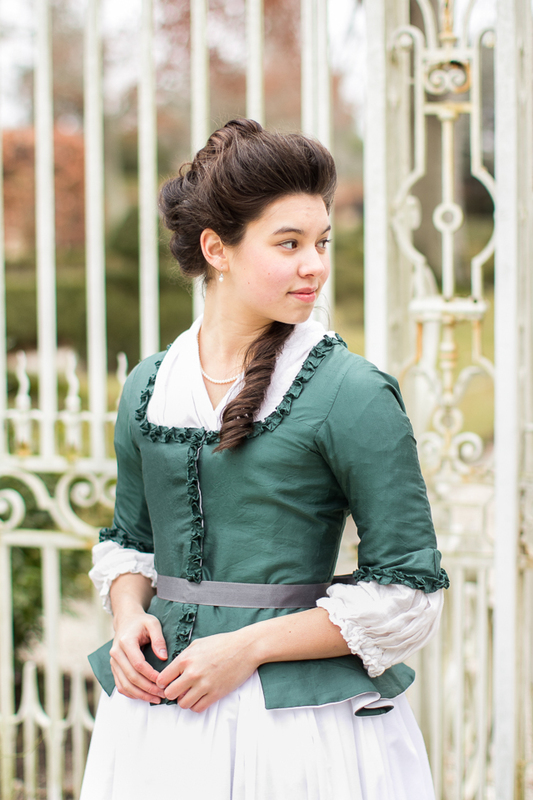 You look lovely in your Williamsburg Dress! Keep up the good work! I'm in love with your bodice! It fits so perfect. Lovely! This shade of green matches you perfectly! Hi! I'm new to your blog, and enjoying my look around! Also, those pictures are GORGEOUS! Wonderful post...and such beautiful photos! Beautiful costume and gorgeous pictures!! 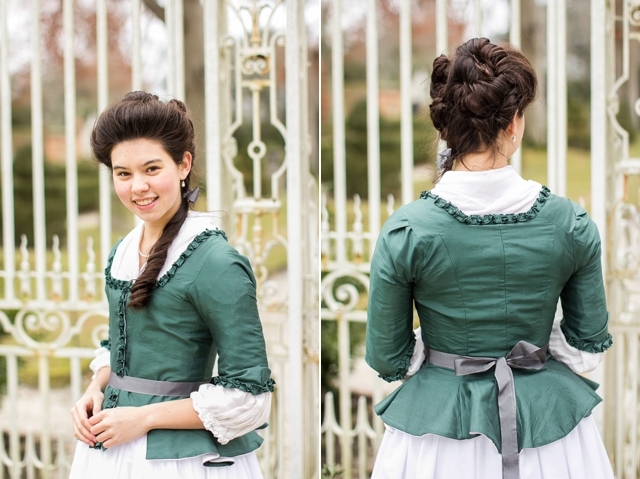 I stumbled upon your blog just now and your projects are so inspiring! Do you wear the costumes anywhere once you make them? You have inspired me to get back into sewing again! I do wear my costumes to events. Our family likes to do English Country dancing, so we often host costume balls, which is mainly where my outfits get worn. I have a question. Where do you buy your linen? I've bought my linen mainly from Fabric.com. They have a lot of great colors for cheap!